Paul Weller is an English musician and singer-songwriter, style icon and national treasure. Starting with the band The Jam (1976–1982), Weller went on to branch out musically to a more soulful style with The Style Council (1983–1989). In 1991 Paul Weller established himself as a successful solo artist, and remains a respected singer, lyricist and guitarist. Eventim is the place to look for Paul Weller tickets and tour dates. To be the first to hear when more Paul Weller tickets go on sale you can sign up to the Eventim Ticket Alarm below. 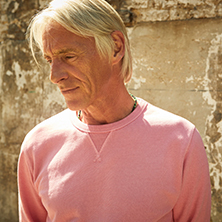 Paul Weller tickets at Eventim.co.uk - your link to everything Paul Weller - concerts, tours, tickets, news and reviews. Paul Weller is an English singer-songwriter from Surrey. He started by joining the punk rock band The Jam. He then went on to branch out of traditional rock and allowed his soulful expression to come out when he joined The Style Council. To this day he is still well respected as a guitarist and lyricist, and in 2009 he was awarded with the title of Best Male Solo Artist at the BRIT awards. His songs nearly always relate to his British roots, and the United Kingdom is his principal musical hub as he never branched out into the international market. He is most renowned for the mod revival in the 70s and 80s and is often fondly referred to as the Modfather. Born in Surrey, he was originally called John yet changed it to Paul. He wasn’t brought up into a musical house - his father was a taxi driver and his mother was a part-time cleaner. His love of music came in school where he first learnt to play the guitar. In 1972 he formed his first band the Jam where he was the bass guitarist for the band. Weller’s father became the manager for the group and organised as many gigs as he could, usually in working men’s clubs. The Jam were a new wave band and their first single In The City took them into the top 40. Their single Going Underground became a number one hit in the United Kingdom. In 1982 the band announced they would split up, with farewell concerts organised at Wembley, tickets for the concerts sold out in record speed. Weller then formed the Style Council with friend Mick Talbot who played keyboard. The band branched internationally and hit out into the billboard charts, they appeared on the Band Aid single but slowly UK popularity for the band was decreasing and in 1989 after the last studio album, the band split up. Paul Weller then set about a solo career, with his work becoming more soulful in comparison with his older New Wave days. He has released ten albums as a solo artist, all in the British top 10 album charts; including Stanley Road in 1995, Illumination in 2002 and 22 Dreams in 2008 which all became number one albums. Paul Weller tickets are popular with both old and new fans. Eventim is the place to find Paul Weller tickets and tour dates.